中文版 – At AWS, we are excited to support The Apache Software Foundation, championing an organization that is delivering software for public good. 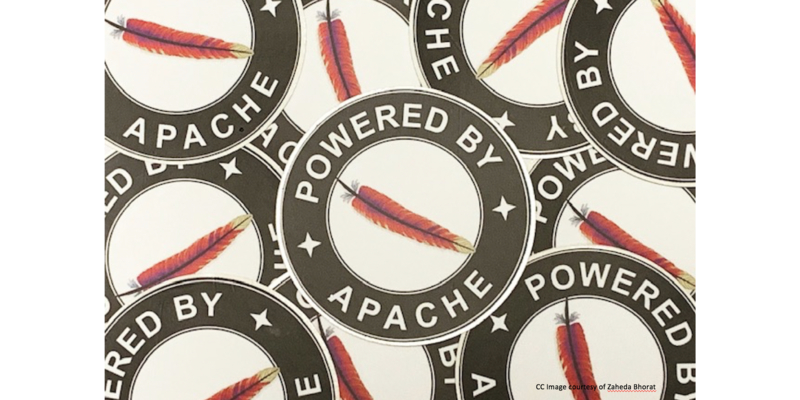 Apache’s software is core to much of the Internet and is used by many of our customers and community. We’re happy to kick off 2019 by increasing our support of The Apache Software Foundation: we are now extending our commitment to The Apache Software Foundation with Platinum-level Sponsorship. Over the years, the ASF has incubated, raised, and championed many open source projects. With over 350 projects, the foundation provides infrastructure, support, stewardship, mentorship, and guidance to help open source software and developer communities flourish. Mentors are key to open source projects, with newcomers relying on them for coaching. In the early days of open source there were far fewer projects, and mentors were rare – but many of them came from The Apache Software Foundation. Two of my own key mentors, ASF founder Brian Behlendorf and early ASF member Greg Stein, helped guide my projects with their knowledge, passion, and continued commitment to The Apache Way. The first recorded contribution to an Apache Project by an Amazon employee came from Andrew Lusk in 2006, to the Apache ActiveMQ project (a C++ client). In 2009, the AWS EMR team made contributions to Apache Hadoop, and the Website Application Platform team contributed to Apache Tomcat. AWS contributions continued over the next few years to include other Apache projects like Hive, Pig, Drill, BigTop, Zeppelin, HTTP Server, and Commons. In 2013, we made a large contribution to Apache Cordova, adding Amazon FireOS support. Many of our engineers, such as Robert Muir and Mike McCandless, were already contributors to ASF projects before they joined AWS. Robert worked with the Apache Lucene and Apache Solr projects as part of his role at AWS, which led to three more employees earning committer roles on these projects. Mike continues to be a very active contributor on behalf of Amazon to Apache Lucene, the storage engine that powers Solr and Elasticsearch. More than 30 current Amazon employees are Apache committers, with some, such as Danny Angus, Aaron Bannert, Musachy Barroso, Jeremy Boynes, Sergio Fernandez, Colm MacCarthaigh, Suneel Marthi, and Henri Yandell having mentored projects for many years. We even have emeritus members from way back, like Andi Gutmans, within our Amazon open source community. In 2016, two of our Berlin-based Machine Learning team members, Kellen Sunderland and Felix Hieber, became committers on the Apache Joshua (Incubating) project. We encouraged MXNet to become an Apache Incubating project in January, 2017, and hired some of the committers to work on the project full-time. While AWS is a large contributor to Apache MXNet employing many of the committers and mentors (too many to list on this post), the community is actively working on building a wider group of contributors, as well as graduating as a Top Level Project (TLP). Other key contributors on Apache projects include Zach York on Apache HBase, Jonathan Kelly on Apache Bigtop, and Ryan Schmitt on Apache HttpComponents. Projects and foundations need all types of contributions, and some of our contributions have come in the form of content and documentation. Aaron Markham, now a committer, has been producing content and working with other contributors to produce Machine Learning content for Apache MXNet. In addition to our new Platinum sponsorship, we have been a Targeted Sponsor of the ASF for the past two years. AWS credits also helped support the technical infrastructure that enables the ASF to operate. Participation in and sponsorship of events can also help bolster projects and foundations. Our Apache members have attended and spoken at ApacheCon events over the years. We were Gold sponsors of ApacheCon 2018, and we’ll be in Las Vegas at ApacheCon 2019 in September – we hope to see you there as well! 2019 is also the 20th Anniversary year for the ASF. We’d like to wish the ASF a Happy 20th year, and we look forward to being an active contributor as part of the next 20 years of community-led development. Zaheda Bhorat is the head of open source strategy at AWS. She has been instrumental in growing the AWS Open Source team and contributions. A computer scientist, Zaheda was one of the co-creators of Google's Open Source Program Office and several successful programs including Summer of Code. She also brings a deep understanding in open standards from her work as head of open standards at Google, and as senior technology advisor for Government Digital Services, UK Cabinet Office. Here she drove policy for the adoption of open document formats. Zaheda has held many open source and technology leadership roles. At Sun Microsystems, she lead the project and the global community responsible for the success of OpenOffice.org and NetBeans.org. At Apple, she managed the EMEA and APAC online service teams. She serves on the board of the Mifos Initiative, where she combines her passion for technology, open source and social good. You can find her on Twitter @zahedab.